Home » Power Trim: Don’t Just Trim do Power Trim ! Power Trim: Don’t Just Trim do Power Trim ! DraftSight Come up with very cool features for premium customers in DraftSight 2015 : Power Trim and Corner Trim. These features will definitely boost your speed than regular Trimming method once you know how much beneficial these tools are. Where are these features in DraftSight 2015? And on Modify Toolbar with same Symbols . Also DraftSight introduced new Command POWERTRIM . From Command Line options you can change power trim to Corner Trim . Q. So how fast yo can trim left side portion and make it like right side in attached Image ? Answer: with Power Trim in one go! This is very simple feature if you have two intersecting line and want to trim at Corner. When this option is in use then Mouse pointer will change to Picbox to pic lines where you want to corner trim as below. After selecting first line and move picbox over second line then this will highlight trimming portion as dashed lines as below. Click second line and repeat this step for rest lines result will be as below. See Power Trim in Action! Hi Sam. I am one of the old type draftsmen and picked up AutoCAD very late, but now retired I still do some piping layouts, but find that as I have to use Draftsight 2015 SP2 I am having trouble using trim. basic trim is ok if cutting a line that crosses another line, but say you have a pipe crossing another pipe you will need to pick both lines of one pipe to trim pipe that goes behind. How does Draftsight do this? I have also worked with Piping Layouts in AutoCAD for some time. You are talking about pipe lines with different elevations right? Well in that case DraftSight works similar to autocad and Trim lines portion which is behind another pipe lines. This intersection is Visual intersection. Just trim as you trim with cutting edges and segments to remove. Faster method would be to use POWERTRIM command and trim part which you want to remove. 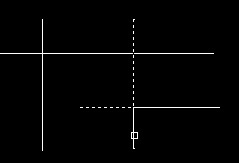 Virtual Intersection points can be selected by using ESNAP Grip. 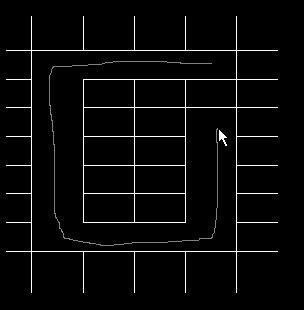 Press SHIFT + Right click inside Drawing area and select Visual Intersection. Thanks for your comment, but the trouble I have is this. when I have a pipe crossing a pipe I would click onto trim then left click onto the first line of the pipe then click onto the second line of the pipe, and both lines would change to dotted this would then allow me to remove the unwanted part of the pipe behind. but what is happening now is that when I go to click onto the second line of the pipe the first line goes back to solid, if I try to remove the unwanted part it removes all of the pipe to the left/right of the dotted line. I have been able to click onto more than one line at a time but have changed something and I do not know how to get it back. I would be grateful if you could explain it to me in basic form. Is this pipe created with any special entity type or from just normal LINE Command (Draw twice to look like Pipe)? I have drawn 4 lines (2 Horizontal and 2 vertical) crossing each other. and with Trim command I can trim desired portion . Is this happening with only one file or all. Try to create & trim 4 lines as I mentioned above in New file. If you will face this problem again then follow this 5. Renaming DraftSight folder on %appdata% . This will reset DraftSight to default. I am using DraftSight 2015 SP2 on my Windows 7 (64bit) laptop. Which version of DraftSight are you using and on which OS? If problem is not resolved from above methods then you can send me a demo file on my mail id [email protected] , I will check here. Or you can post technical problem in DraftSight Community.